I’m a recording artist and songwriter here in Nashville, and I’m on a unique mission with my latest album. Above the Rug is made up of ten original tracks and I’m tithing the entire CD. This means one song of the ten, exactly 10 percent, will be completely given away. Track ten, Empty, is my chosen tithe song. Every time someone downloads Empty, 100% of the proceeds go directly to CASA, a non-profit that advocates for neglected and abused children who have been brought to the attention of the courts. I graduated from CASA’s training program this year and was sworn in by a Nashville magistrate as an approved volunteer to advocate for abused and neglected children’s interests. I was first inspired to help with this cause while visiting my sister who had just become a foster mom. I watched as my sister got the long-awaited call from a social worker and had an abused four-year old delivered to her doorstep the same day. I got to meet the frightened boy and see first hand what a little one goes through when brought to a strange home after an already traumatic experience in their own home. I also saw what it takes for a loving family to open their home to an extremely troubled, yet innocent, young child only to lose him when he returns to his biological parents. It was definitely questionable as to whether that was the best decision for the little boy. I knew I had to do something. Being in the music industry can be very self-focused and self-promoting at times, but I want this album to be about helping other people. I feel compelled to not only tithe my income, but to also tithe my talents. 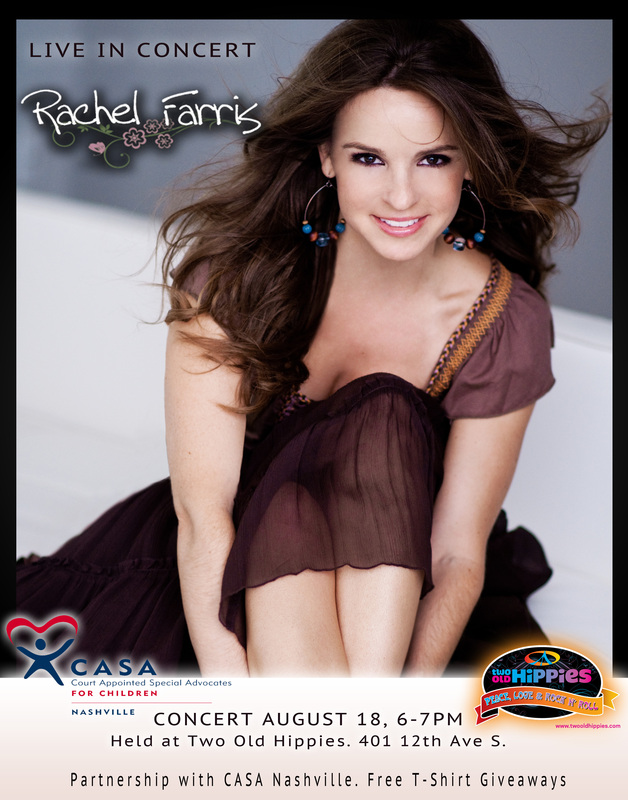 I am currently scheduling a tour and look forward to singing at several future CASA fundraisers and events. I’m giving a free concert tomorrow, Saturday August 18th, at Two Old Hippies at 6:00pm to celebrate my CASA partnership and the new album. Feel free to visit www.rachelsmusic.com for future dates, news, and to keep in touch. Thank you. I hope to see you Saturday!